Look in your service manual for instructions about priming. I'm not familiar with your specific tractor but with most you need to prime the fuel lines. It is not hard to do, but more a pain. From now on you will always keep the tank to about 1/8th or more. You need to bleed the fuel lines/pump. Sometimes you can fill up the tank, loosen the sediment bowl a little and turn on the fuel. The fuel will run down and push most of the air out of the sediment bowl; tighten it up once fuel starts to run out. 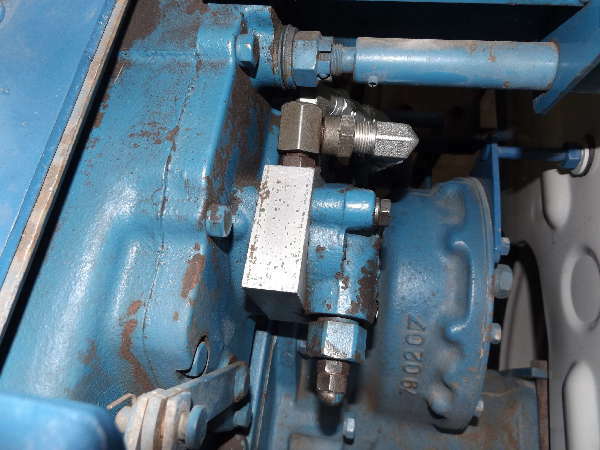 If the tractor still won't start, you then need bleed air from the top of the injector pump. Usually you loosen or remove a bolt from bleed port and crank the engine until fuel comes out. It may start while you're doing this. The fuel is under high pressure and is dangerous; it can penetrate skin. If the tractor starts and runs, you're done. I have pretty good luck when it comes to running out in my New Holland TC33D CUT and LS180 skid steer. I can crank them over four or five times and they start right up with no bleeding or anything. Now my Cummins Dodge is a different story. I have actually used a pneumatic blow gun wrapped in duct tape to make an adapter to fit the fuel filler neck opening. A cople shots of air and this pressurizes the entire delivery system and in seconds it starts up. I know what you're thinking---I get too busy and forget about the fuel level. DOH!